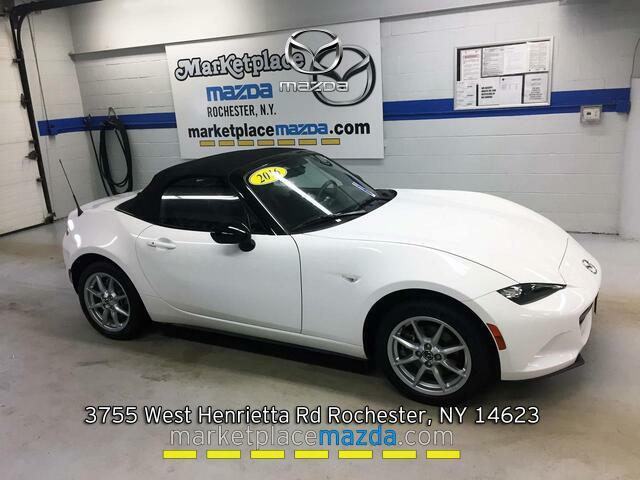 *One Owner, Clean CarFax, Manual Transmission, Steering Wheel Audio & Phone Controls, Cruise Control, Fog Lamps, Alloy Wheels, Traction Control, Auxiliary & USB Audio Inputs* Mint 2016 Mazda MX-5 Miata Sport! Cruise Control becomes your favorite option anytime you're on the highway! Steering Wheel Audio & Phone Controls allow you you to change a station or answer a call without having to take your hands off the wheel! Includes Fog Lamps an excellent asset in our climate! The Alloy Wheels are in great shape & add to an already stunning exterior! Keep your most precious cargo safe with the included Side Impact Airbags! Have Questions? My name is Taylor please contact me directly at (585) 797-3282 to confirm availability as multiple vehicles are sold daily.